Making the Switch to FlowGuard Gold CPVC | Lubrizol Advanced Materials, Inc.
FlowGuard Gold CPVC can help you save time on labor, while also saving money in materials and installation. In fact, recent studies have shown that CPVC installs 15% faster than PEX and is the lowest material cost option. When you choose FlowGuard Gold CPVC, you’ll get the peace of mind knowing our products will never fail due to contact with drinking water, unlike the competition. Materials like PEX and copper are incompatible with many American water supplies, resulting in corrosion, degradation, pinhole leaks and failures. While PEX and copper systems can fail due to contact with normal drinking water, FlowGuard Gold CPVC has been proven as the plumbing system that professional plumbers have been installing since 1959. There have been at least 10 class-action lawsuits filed against PEX plumbing systems since 2008. These lawsuits stem from failures allegedly due to incompatibility between the PEX system and the water flowing through it. FlowGuard Gold CPVC has been used for more than 60 years with zero class-action lawsuits. Learn more about the other benefits of FlowGuard Gold CPVC in the Make the Switch brochure. 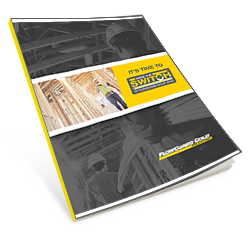 Get started today by completing the form to download your copy of the Make the Switch brochure.